Heart's Delight Cards: Birthdays, Birthdays, Birthdays! Today I am thankful for the five loads of laundry I did, because it means my family has clothes to wear, a bed on which the linens go, and I have the means to keep them clean. Another GORGEOUS card! 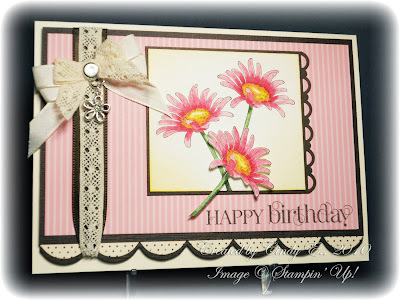 The patterned paper, colors, and the COLORING are fabulous! The way one of the flowers breaks the edge of the panel is perfect. Another beautiful card! Wow! This card is absolutely beautiful! Those flowers are amazing! Bawawa funny! I love your card soo pretty!!! This is just stunning, Cindy! Gorgeous coloring!